Servers.com Review 2019: Is Servers.com a Good Hosting? Founded in 1998, Servers.com operates an automated and standard hosting platform that integrates bare metal servers, cloud hosting, and CDN in one package via private networks. The company serves small- medium scale enterprises. Servers.com boasts of a suite of integrated shared hosting, VPS, and Cloud computing that runs on global private networks that cover three continents. Their data centers are located in the USA, the Netherlands, Luxembourg, Russia, Singapore, and Hong Kong. Servers.com has secure, compliant, and redundant networks and low-maintenance hardware that deliver great uptime and stability. They use the latest Dell-servers with dual redundant power sources and automatic switchovers. So their performance and reliability aren’t questionable. With a range of configurations, Servers.com allows you to assemble hosting resources that meet your needs and budget. Suitable for hosting websites or apps with heavy traffic, their dedicated servers, are fully customizable and scalable. You can order a server and have it deployed within 40 minutes. Simply choose your OS, allocate alias IPs, configure networks, change uplinks, and get the amount of RAM, and SSD or HDD that you want. 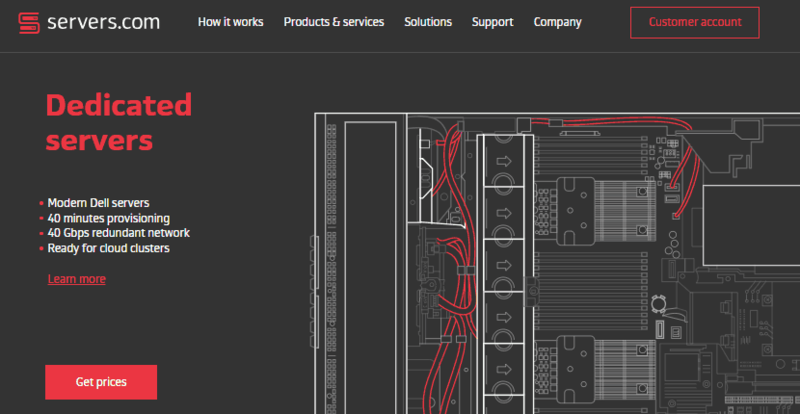 Their servers use Intel Xeon E3 processors and come with at least 32 GB DDR3 and 1Gbps at a location of your choice. There’s no need to make a request or contact the tech support. If you’re looking for a web space that’s easy to configure, the Instant cloud is a great option. You can deploy one within a few minutes. Just specify the name and location of the virtual machine and choose RAM, vCPU, SSD and bandwidth configurations in the control panel. Daily backups are automated and backups are performed daily. From your control panel, you can configure your dedicated servers, VMs, firewall, and perform DNS health checks in real time. CentOS 7 comes with cPanel/WHM that lets you manage your web space conveniently. You also get access to a good number of add-ons such as server health alerts, unlimited backups, and server troubleshooting tools. Upgrades are fast and smooth. You just need to select your computing power, the number of CPUs, and disk capacity from the Customer Portal. Using OpenStack API, you can scale on the fly and automate deployment as well as the management of your VMS. It doesn’t require additional action from you or from the support team. Servers.com not only uses flexible targeting but bills customers based on analysis of their actions. You’ll get the number of resources that you require in a private Cloud at a fixed price and a flexible pricing on the public Cloud. You can save more and manage your expenditure effectively with their Hybrid Cloud. Their cost allocation and strict power distribution notwithstanding, you still are able to enjoy optimal hardware performance. With a reliable support team, Servers.com ensures that your issues are solved quickly and professionally. Technical support is available 24/7 courtesy of a remote team of on-site technicians, who are fast and efficient. If you want to make an inquiry or request help, you can write an email or open a ticket. Response time is less than one hour. I don’t think they offer telephone support. I recommend their chat support as it is pretty fast. Aside from the support team, they also give you access to a detailed knowledgebase and other key information. Servers.com is a solid IaaS hosting platform that offers a variety of high-end services, such as dedicated servers, Cloud computing, and GPU servers to customers in Europe, Asia, and the USA. Wondering how Servers.com stacks up against other Web Hosting companies? Enter any other Web Hosting company and we will give you a side-by-side comparison.